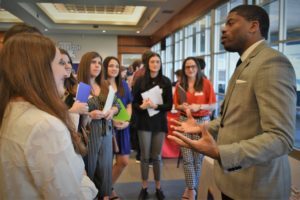 The Clinical Residency and Recruitment Center (CRRC) in Louisiana Tech’s College of Education hosted its inaugural TEAM (Teachers Educators and Mentors) mid-year recruitment event Jan. 10. The event provided junior education majors who will participate in the 2019-20 residencies with an opportunity to meet and network with current partner districts that host residents across the I-20 corridor: Bienville, Bossier, Caddo, DeSoto, Webster, Lincoln, Jackson, Winn, Ouachita, and Monroe City Schools. Later that afternoon, senior TEAM Model clinical residents participated in a traditional teacher recruitment fair. The CRRC develops and refines capstone experiences for clinical residents at the College of Education. Central in this is effort is the TEAM model, developed by associate professor, Dr. Amy Vessel and Associate Dean Dr. Dawn Basinger of the College of Education. The TEAM model replaces traditional student teaching with a full-year (August-May) clinical residency experience. This model provides a true apprenticeship as Louisiana Tech faculty and K-12 school faculty collaborate to prepare highly effective K-12 teachers. Providing a special component to the teacher recruitment event, Dr. Patsy Hughey, Master of Arts in Teaching (MAT) Coordinator, led an informational meeting speaking to the benefits of the program, which provides an opportunity for anyone with an earned bachelor’s degree who is interested in becoming a teacher and meets program entrance requirements to pursue a Master’s Degree and receive a certification to teach while working as a teacher in a local school district. This alternative certification program is designed for persons who already have received a bachelor’s degree in a non-teaching area of study and who have a strong interest in teaching in a PK-12 school. To learn more about the Clinical Residency and Recruitment Center, email crrc@latech.edu.